Dates of birth and death unknown. Second son of Sakata Tôjûrô I, he started his career in Kyôto in the 3rd lunar month of 1705, where he produced as a zamoto the new year drama "Keisei Inaba no Matsu" at Hoteiya Umenojô's theater in which he performed as a wakashugata. He coproduced, along with Asao Jûjirô, in Kyôto the new year drama "Keisei Nezamegaseki", which was staged with the actors Otowa Jirosaburô I, Yamamura Kazaemon, Ichimura Tamagashiwa I and Sawai Sonoemon. He became wakaonnagata in the 1st lunar month of 1704 in Kyôto and played the role of Princess Hatsuhana in the new year drama "Keisei Ishiyamadera", which was produced by Sakakiyama Koshirô I. He appeared on stage for the last time in the 1st lunar month of 1712, in Kyôto, where he played the role of the keisei Izumikawa in the new year drama "Keisei Nehan no Toko". No record afterwards. Dates of birth and death unknown. Elder brother of Sodeshima Genji, he started his career in Ôsaka as a disciple of Sodeshima Ichiya I. He took the name of Sodeshima Ichiya II after the death of his master. He was recorded as performing as a wakaonnagata in 1681. He was selected to be illustrated in the book "Kokon Shibai Irokurabe Hyakunin Isshu", which was published in the 1st lunar month of 1693. He went to Edo and performed at the Nakamuraza in 1688. He went back to Ôsaka the following year. He went to Edo and performed at the Yamamuraza in the 7th lunar month of 1694. He became kashagata and disciple in Kyôto of the star Sakata Tôjûrô I in 1699, who gave him the name of Sakata Ichiya. 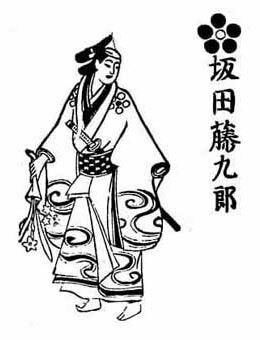 He became katakiyaku and took the name of Sakata Naoemon in the 11th lunar month of 1701 in Kyôto. He took the name of Sakata Seiemon in 1706. He played in Kyôto in the 1st lunar month of 1708 the role of Kumagai Kuniemon in the new year ni-no-kawari drama "Keisei Akatsuki no Kane", which was produced by Sakakiyama Koshirô I. His rank in the 1708 Kyôto hyôbanki, katakiyaku section, was jô (superior) [visual]. He played in the same theater in the 3rd lunar month of 1708 the role of the karô Ajirogi Sômanojô in the drama "Shôbô Daishi Happyakunenki". No record afterwards. Born in 1668. Elder son of Sakata Tôjûrô I, he started his career in Ôsaka in the 11th lunar month of 1686, performing as a wakashugata in the troupe led by the zamoto Araki Yojibê I. He went to Kyôto in fall 1693 and performed in the 11th lunar month in the drama "Hako Denju", which was produced by Murayama Heiemon III. He went back to Ôsaka in the 1st lunar month of 1696 to perform in Tominaga Heibei's drama "Kumano Sankaichô", which was produced by Arashi San'emon II. He went to Kyôto in the 1st lunar month of 1699 to perform as a tachiyaku in Chikamatsu Monzaemon's drama "Keisei Hotoke no Hara", which was produced by his father Sakata Tôjûrô I. No record afterwards.